In an apparent attempt at political correctness, Apple is trading in their six-shooter for a squirt gun in their latest update, which also includes a plethora of diversity-minded updates to the emoji set used on iPhones, iPads, iPods, and other Apple devices. According to this week’s release from Apple, “[t]his exciting update brings more gender options to existing characters, including new female athletes and professionals, adds beautiful redesigns of popular emoji, a new rainbow flag and more family options.” Thank goodness! Our Apple devices were barely usable with their misogynistic, homophobic emojis full of hatred and violence and cartoon guns. Such emojis are rendered differently on various platforms such as Apple devices, Windows devices, Android devices, and social media platforms such as Facebook, Twitter, and Instagram. 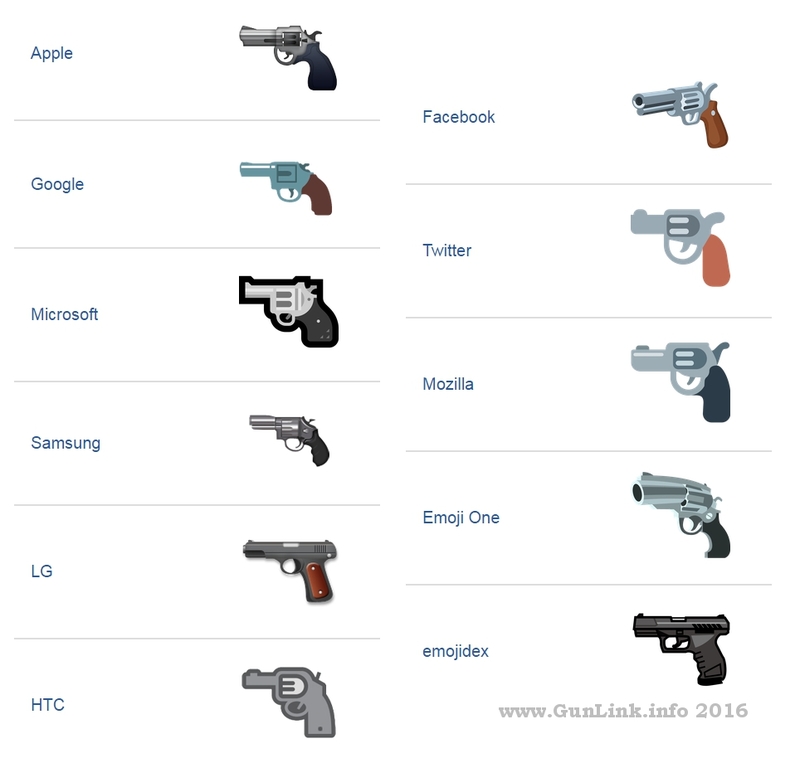 The GunLink Blog back-end also renders emoji key-sequences into their appropriate images, including the gun emoji which, at least currently, most closely resembles the Twitter revolver as shown at left. We’ll just leave this here in case that changes in the future:  pew pew! To be honest, we are a little surprised that, in today’s PC world where kids get expelled from school for gnawing their Pop Tarts into the shape of a pistol, any change at all still brought a “violence promoting” gun-like object, even if it is still just a squirt gun. 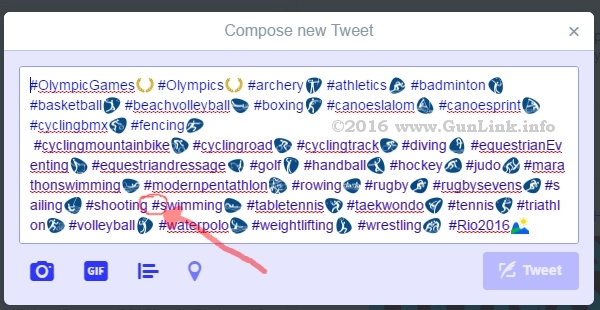 That’s right, the dweebs in charge of Twitter pulled the Olympic Shooting Sports emoji. I guess that’s OK – with the Olympic-sized Charlie-Foxtrot that the crime-plagued Rio event will be, I’m certain that many of the Olympic athletes will see their fair share of guns. However, in a surprise move, the Windows 10 Anniversary Update (code name “Redstone”) released yesterday went in the opposite direction. This update changes the gun emoji from a space ray gun with which Marvin the Martian would be proud to hunt down Bugs Bunny (aaaah, remember back when cartoons were violent and children weren’t?) to a real-deal “realistic” cartoon revolver. The streets will, no doubt, run red with blood due to this update. This appears to make it twice in one week that Microsoft has won the “don’t spew leftist propaganda and PC garbage” game against competitors. Before winning the Gun Showdown in the emoji category, Microsoft’s Bing search engine also recently beat out competitor Google in the Give Genuine Results Instead of Shilling for Democrat POTUS Candidates category. Whatever is going on at Microsoft, I hope the trend continues.